Patient Satisfaction: 98% of patients we speak with agree to continued contact. Reinforced Care is able to reach out to patients in a consistent and comprehensive way after they leave the hospital, and then to triage back to the hospital those situations that require clinical intervention. Well before the implementation of the Affordable Care Act in 2012, ReInforced Care was working with hospitals to improve patients’ post-discharge experiences; to enhance hospitals’ understanding of those experiences; and to reduce 30-day readmission rates. Now that Medicare reimbursements have been made contingent upon readmission rates, the need for effective, large-scale patient outreach post-discharge is even more acute. In recent years it has become more and more clear just how difficult it is to reduce readmission rates – or even to predict just which patients will readmit within 30 days. Still, studies (see Resources) have shown how these rates can be reduced with better discharge management and follow-up care. By proactively and comprehensively communicating and interacting with the patient and various caregivers, hospitals can markedly reduce “bounce-back” while improving patients’ health and overall experience. ReInforced Care uses our sophisticated information platform and our team of Health Service Representatives (HSRs), under the guidance of a Clinical Director/Registered Nurse, to make compassionate, focused telephone contact with a target population of patients that we help you identify. After each call, we capture all patient feedback in our specially designed information platform where it is available for you to review and utilize. Our HSRs are cordial, compassionate, customer service professionals who are trained to: carefully identify patient needs; diplomatically offer self-care reminders to patients with certain conditions; navigate technically-sophisticated software that enables them to tailor their conversation to the individual’s circumstances and past responses; and systematically collect important feedback that is then communicated back to your hospital staff. ReInforced Care’s HSRs have multi-lingual capabilities and can communicate with patients in English, Spanish, Portuguese, and other languages. The diagram above illustrates key features of our system. Data from the hospital are incorporated via automatic, secure transfer into our platform. Our HSRs use these data to become familiar with patient cases, to provide telephone support, and to collect health-related and other patient-centered information. This information is made available to the hospital in real time via our Portal. We also use the data to produce ongoing descriptive reports, and after further analysis we share more in-depth findings via in-person or secure online presentations. Review and reinforce discharge instructions, e.g., regarding diet or activity. Find out whether all prescribed services are in place, e.g., home health/visiting nurse services. Learn whether a follow-up appointment has been made and/or kept with a primary care and/or other physician. Confirm that the patient has acquired any prescribed medications. Discuss any other immediate needs, e.g., for durable medical equipment or referrals to medical records, billing, an MD, a smoking cessation hotline, or financial counseling. Learn whether help is needed to connect with appropriate hospital personnel or with downstream providers. Bring to the attention of hospital staff any issues that require their attention, via our secure live Portal. Ask for patients’ perceptions of their readiness to leave the hospital and about their experience with the hospital and with after-care. Preserve testimonials that the hospital can use in its marketing efforts. We firmly believe that this type of human contact is superior to automated “robo-calls.” While we have the capacity to conduct the latter as well, we are convinced that our call team – operating under the guidance of an experienced clinician – as well as our sophisticated software programs, achieve better results than those obtained through the use of automated systems. The ReInforced Care Portal is a vital part of our two-way communication system. Via the Portal, we provide you access to the “voice” of your patients once they leave your facility. After speaking with your patients, our HSRs summarize all communications in a digital note that is available to your staff. A. Better care for individual patients after hospital discharge. Receive automatic, real-time alerts about patient needs – categorized by level of urgency. 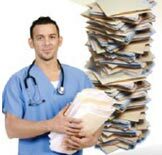 Obtain quick summaries and/or in-depth accounts of each patient’s status, experiences, and opinions. Track your post-d/c interventions, those of other providers, responses from patients, and results. Add a helpful structure to the way you and your team respond to and communicate about patients. B. Analyze the experiences and needs of your patient population. See the incidence of about 40 types of events including symptoms, medication issues, informational/equipment/communication needs, complaints, and testimonials. Analyze these in conjunction with many other data elements, e.g., on diagnoses, attending and primary care physician, unit, dietary instructions, and insurance. Recognize which of your interventions worked best. Identify trends over time and break out results for sub-populations of interest. Identify specific improvements that can be made to hospital units or to aspects of care or discharge planning. Obtain testimonials to use in recognizing superior performance by your employees. Compared with systems that assign large numbers of phone calls to nurses, our system frees up your nursing staff to perform the work for which they are trained. We remove the frustration and expenses related to nurses looking up contact information; dialing and re-dialing the phone; confirming identity; and leaving messages, as well as the time-consuming task of tracking phone call results and capturing patient feedback. Of course, when intervention by one of your clinical caregivers is required, our HSRs are trained to quickly escalate the matter to your staff. Given that the majority of patients typically do not require clinical assistance at the time of a call, utilizing nursing staff to make these calls is not the best use of their time. In addition to capturing critical information, our team also provides your patients with much-need post-discharge follow-up. We also provide your team information about each patient’s after-care needs and concerns, as well as access to a wealth of aggregate information and analysis regarding important trends impacting your hospital.